Mom, the Intern: Gettin' crafty. Last night, I learned how to make some pretty flower clips. This would normally not be considered news, especially with regards to a young LDS mom like myself, but for me, it's top story material. I am the antithesis of crafty. I can draw, yes. But my motor skills are SEVERELY lacking. Let's just say in kindergarten, I got 1's and 2's in cutting and pasting, while the rest of the class was getting 4's and 5's. To this day, I can't cut in a straight line, can't fold straight, can't glue without getting glue everywhere, etc. When it comes to crafts of any kind, I'm a hot mess. And I'm not really ashamed to admit it. I have other talents, so it's OK. Can't win 'em all. But, when the uncrafty finds a craft that is reasonably easy and attempts said craft, they often finish feeling very proud of their accomplishment. So, now it's time for YOU (yes, you!) to learn how to make Mormon Mommy/Baby Hair Flowers. All you really need is a hot glue gun. No sewing involved (go ahead, I'll wait while you finish doing a cartwheel of joy). Buy some fake flowers at any craft store, a few jewel thingies, ribbon, and alligator clips. Glue the ribbon around the outside of the clip, so that it slides through the hair nicely without hurting or getting stuck. Plus it looks cuter. But, I suppose this step could be optional. Next, basically cut/rip/maim the flowers so that the individual petal layers separate from the plastic stem (but don't cut the fabric petals, obviously). You can combine different colors, like I did with Bubby's, or you can do all one color like mine. Layer it up as much as you want. Once you get the petals arranged to your liking, you can start gluing the layers together. All you need is a small drop of glue in the middle of each layer. Finish with a jewel in the middle. 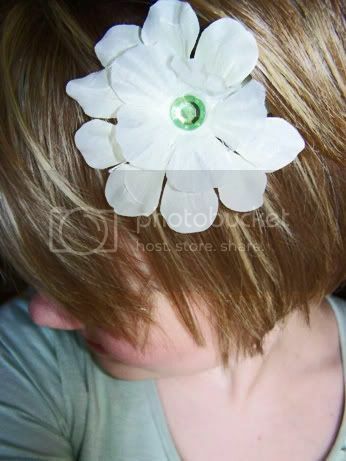 Then, glue that pretty flower you just made onto the alligator clip. Make sure the petals hide the clip well. Easy as pie! 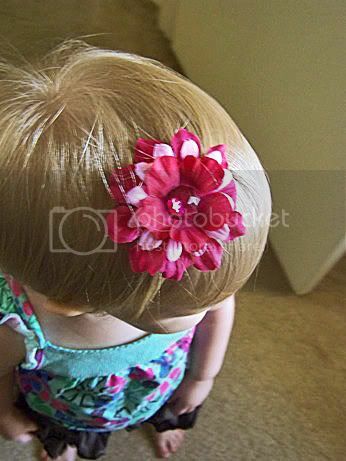 Now, you will be able to clip these flowers into your little girls' hair, or attach them to a headband for a baby (the bigger, the better for this). Or put them on your own head! It's the chic thing to do. That is so very cute! !